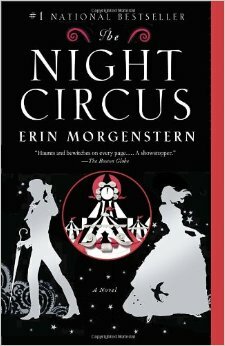 For August, we read, "The Night Circus" by Erin Morgenstern. The novel is about a duel between two wizards, played out through opponents staged in a fantastical traveling circus. At the heart of the book is a forbidden romance. All of the participants agreed that it was one of their favorite books that we've read in the book club! For our purposes, it was loaded down with all kinds of fun imagery to pull from. We had a really fun turn out for the in-person meet-up! Everyone got dressed up in black and white, with pops of red! (That's the color scheme of the Night Circus in the book.) 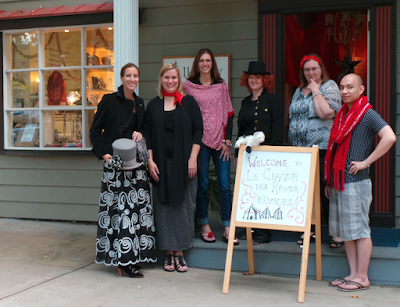 "Rêveurs" or "dreamers" who attend the circus dress up in black and white and wear red scarves to tell who is who. We had quite the spread! Just to name a few things... Alison brought cinnamon churros and caramel popcorn. (To decorate, she laid out printouts of the tarot cards from the book.) 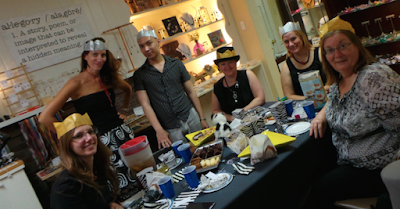 Laurel had a fancy assortment of baked goods and Christmas crackers. 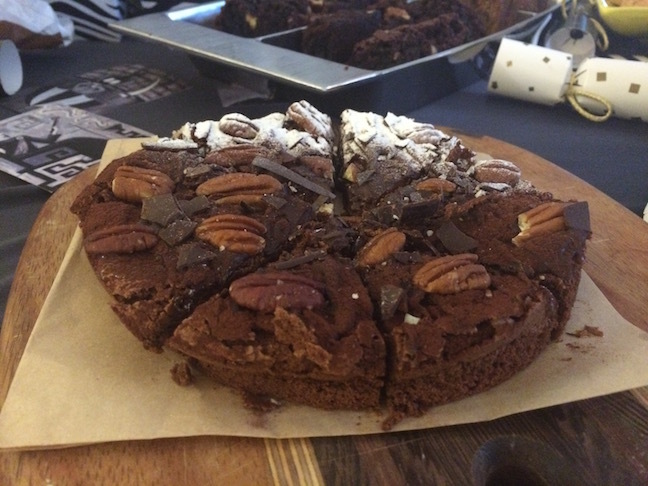 I picked up an tray of pastries from Warrior King Pastries, including this dark chocolate torte. I also made a pitcher of Pimms Cup, since it's a very English summertime beverage and this is the last book club of the summer. Can you believe it's almost fall!?! Here's a picture of the in-person meet-up. We all wore our paper crowns from the crackers. It's always a lot of fun getting together. Although discussion of the book is usually minimal, we always have a good time talking and making things and taking a break from our every day. I look forward to the meet-ups every month! Terri made this bracelet. Here's what she had to say about it: "The Ice Garden is such an iconic image in the book. Everything in that tent is made of crystalline ice. I chose a limited palette, playing off the color scheme of the circus. The lampwork glass beads were made by Catherine Steele and the pearls were harvested from a bracelet I picked up at Ann Taylor. The floral toggle goes perfectly with the glass beads." Dawn made this matching set. Here's what she had to say about it: "I loved the colors from the circus! So I made a matching necklace, bracelet and pair of earrings. This was my first time wire-wrapping!" Dawn also made this matching set. Here's what she had to say about it: "While I was reading the book, I noticed the illustrations of constellations. It moved me to make this set. 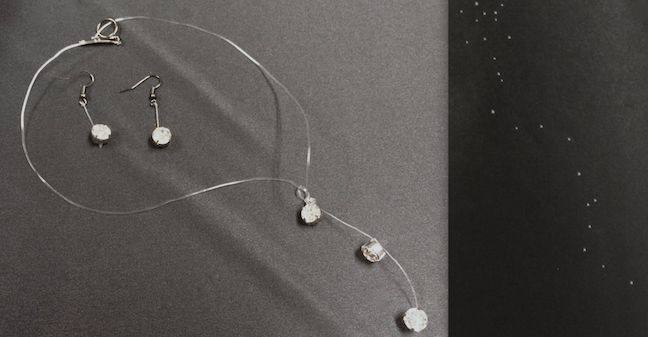 I used clear illusion cord to make it look like the crystals are floating in a constellation pattern. The earrings also dangle, looking like stars in the sky!" Amy made this piece. 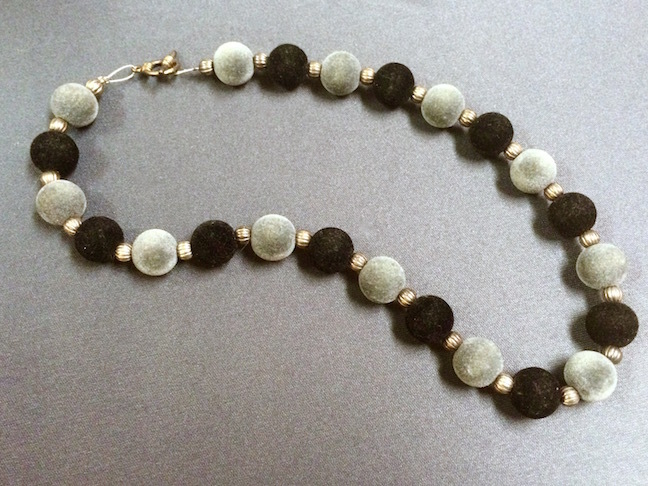 Here's what she had to say about it: "The gray fuzzy beads remind me of the gray suit that Mr. A.H. wears. I added them with black beads, to represent the raven that Celia's dress turns into. I also strung little metal spacers. Those signify the train that the circus travels on." Laurel made this piece. Here's what she had to say about it. "In the book, Madame Padva (the costume designer of the circus) has become quite wealthy from her time in the ballet and has a very fashionable and expensive strand of rubies. They describe the vibrant color of the rubies as almost blood-like and that it looks as though her throat has been slit. I used these crystal to create a choker. I added the beaded tassel for dramatic effect and really look like a spurt of blood!" I've been on a ring kick lately and it just so happens that there were rings in the book! The rings are given to the opponents to symbolize their covenant to the challenge. So, I was really inspired to make this ring. The stone is actually glass that I fused! I mixed black and white frit to create the "half and half" look that is predominant in the circus. Then I bezel set the cabochon on a sterling silver ring. I used a decorative band that I thought had a Victorian vibe. I could totally see this existing in The Night Circus universe!" 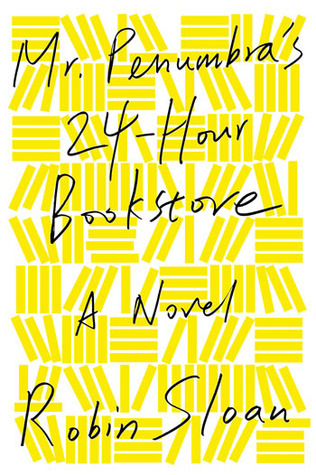 "Mr. Penumbra's 24-Hour Bookstore" by Robin Sloan is up next for September! CLICK HERE to see the full list of books for the year. 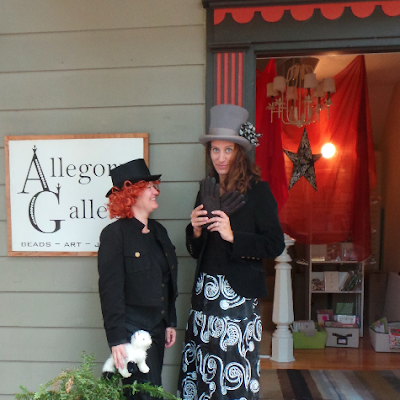 The in-person meet-up is tentatively scheduled for Wednesday, September 23rd. The blog hop is scheduled for the following day. If you're interested in keeping up with what we're doing, CLICK HERE to visit our Facebook page. It's a closed group, so you'll have to request to join. Hope you'll play along! It looks like you all had such fun at the meet up. And all the creations we we lovely. I love the work this month! 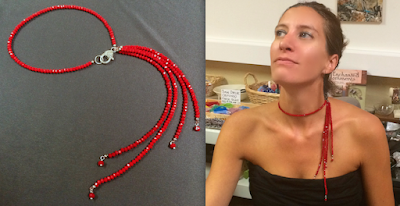 I think my favorite of the pieces on this page is the red choker--very cool! Wish we could have been there! What a wonderful event! How can I NOT read The Night Circus now? Alison & Laurel, awesome costumes! All the jewelry is beautiful too. I'm especially taken with Terri's bracelet and the splash of blood necklace. OMG, what amazing creativity this book inspired. So sad that we couldn't be there for this one... you guys clearly were miserable without us! I love that everyone dressed for the theme too! Great creations by everyone. I'm particularly smitten with Andrew's ring... so awesome that you fused glass for the "stone." Laurel's bloody necklace is super fun too. Terri, I have to giggle at your pearl "harvest" from an Ann Taylor piece. Hilarious way to put it but the resulting bracelet is perfect for the ice garden. Great designs all! I am especially in love with the blood red choker. Really cool post, Andrew. The people you know sound lovely and their enthusiasm is delightful! Fun to read, and the photos add so much as well! Terri's bracelet is great. Those lampwork beads have a wow factor, and pairing them with the re-purposed pearls is wonderful. It turned out beautiful. Dawn did a great job with her first wire wrapping! My favorite thing is when blog hops encourage us to try new things. I really love the circus color palette, and the red and black look great. It was clever to use the illustrations as inspiration for the constellation set. It's pretty - I never would have thought of that! Amy's necklace is lovely and a great use of several inspirations from the book. Looking at all these great pieces is making me want to use this color palette more. I love Laurel's bright necklace. It really is dramatic and chic, just like something Madame Padva would wear! 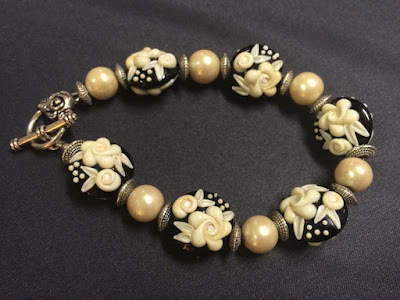 Terri, the raised flowers on your lampwork beads make them look like they are suspended over the black. Cool. 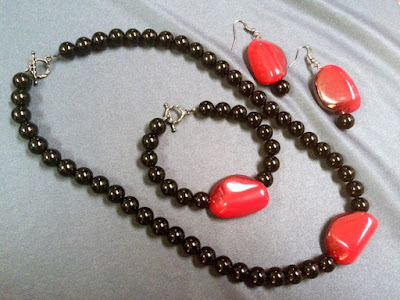 I love the colors and shapes of the beads in Dawn’s first set, and the floating effect of the constellation set. I want to touch Amy’s fuzzy beaded necklace – great texture! Laurel, that tassel is brilliant – it amplifies the slash metaphor, plus it has the theatrical flair of a dancer’s jewelry. Andrew, wow. The “stone” on your ring looks like a mysterious murky alternate universe. The bezel sets it off perfectly.